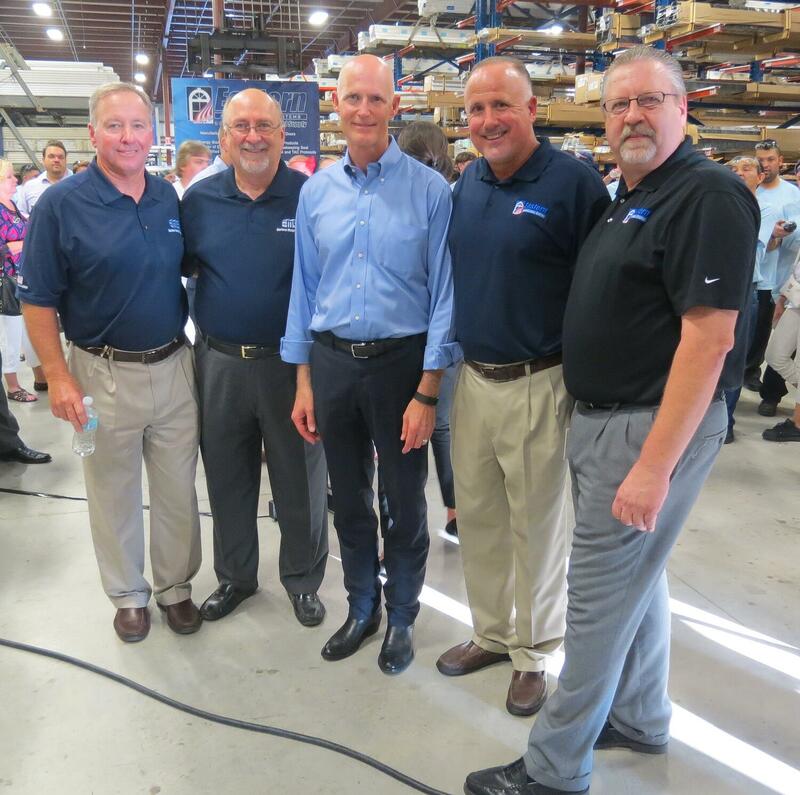 Fort Myers, Fla. – November 16, 2015 – Governor Rick Scott visited Eastern Architectural Systems (EAS), a division of Eastern Metal Supply (EMS) on Nov. 11, thanking EAS and congratulating the company on their success and the opening of their new 172,000 square foot facility in Fort Myers, Florida. He then went on to detail his plan to cut taxes by $1 billion. The tax cuts mainly affect businesses, and Scott's proposal has the potential to save Eastern Architectural Systems, and companies like it, hundreds of thousands of dollars. Scott’s plan includes the elimination of the state’s corporate income tax on manufacturing and retail companies and the permanent elimination of sales tax on machinery, set to expire in 2017. Scott also proposed eliminating the taxes that businesses pay on their profits and cutting the commercial lease tax by one percent. “We’ve got to help our small businesses. We have to diversify our economy,” said Scott. "By investing these dollars, we'll get more manufacturing jobs, we'll get more corporate office jobs, we'll get more retail jobs and we'll diversify our economy." Lee County Commissioner Brian Hamman, Board Member of the Southwest Florida Manufacturers Association Brian Rist, and District Vice President of Florida Realtors® Bill Poteet spoke in support of the cuts. Eastern Architectural Systems (EAS) provides a complete line of custom-made windows & doors: aluminum and vinyl, impact and insulated impact. Tested for strength and integrity, and built with style in mind, EAS windows and doors exceed the requirements and challenges of today’s discerning buyer. Tested for strength and integrity, and built with style in mind, EAS windows and doors exceed the requirements and challenges of today’s discerning buyer. A wholly owned division of Eastern Metal Supply (EMS), EAS is headquartered in Ft. Myers, FL. For more information on Eastern Architectural Systems, please visit www.easternarchitectural.com. Eastern Metal Supply (EMS) is a distributor of standard and custom aluminum extrusions and sheet products including hurricane shutters, architectural products, railing, decking, sign extrusions, and marine extrusions and accessories. Just-in-time delivery programs allow customers to order materials as they need them – freeing up valuable floor space and maintaining cash flow. With various warehouses throughout Florida and aluminum fabrication services, EMS saves customers time and money—thereby helping them to improve their bottom line. EMS has a 30-year reputation as a first class supplier of aluminum products and is headquartered in Lake Worth, FL. For more information on Eastern Metal Supply, please visit www.easternmetal.com. Pictured above (left to right): EMS Vice President Greg Weekes, EMS General Manager Dan Madden, Governor Rick Scott, EMS General Manager Craig Lightle, and EAS Sales Manager Jim Flesher.